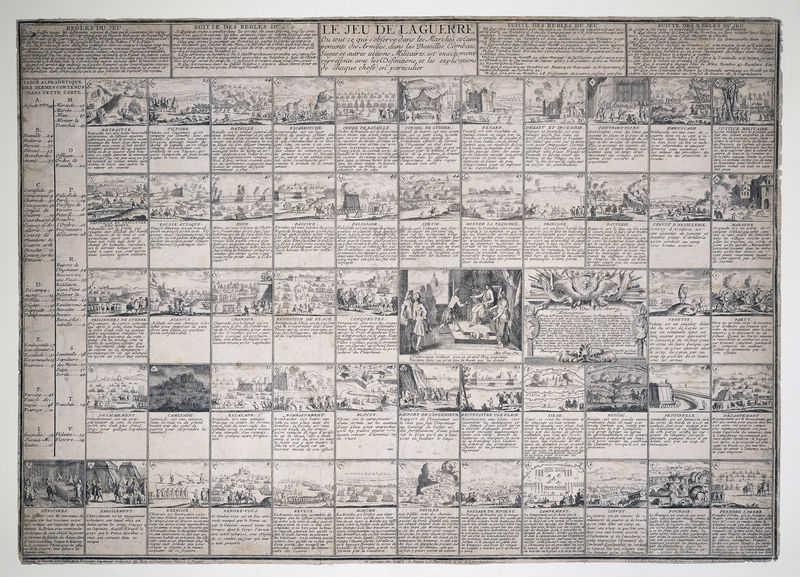 Eighteenth-century European board and card games often had an educational aspect, offering lessons in history, geography or even military tactics and strategy. The Institute’s collections feature a number of games designed to teach young officers-in-training, or the general public, basic concepts of warfare on land and at sea. 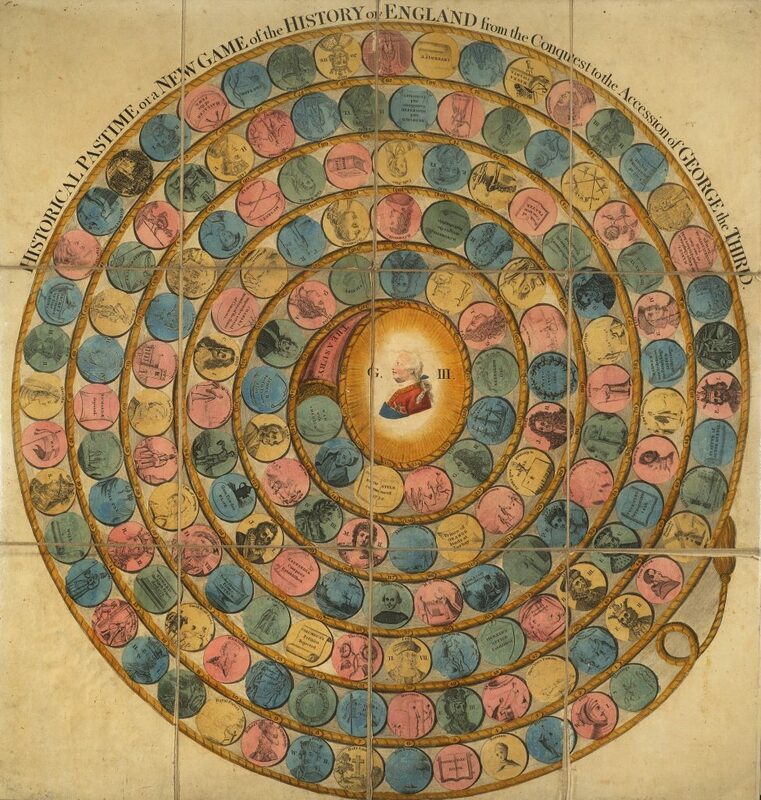 Several of the games in the collections are based on the medieval Game of the Goose, a traditional form of board game in which the players’ progress is determined by rolling dice and following the instructions on the spaces where they land. In early America, toys and games provided amusements for Revolutionary War soldiers and tools for teaching children about American history. The collections include chess and whist game pieces owned by Continental Army officers, as well as a “Historiscope,” a scrolling, three-dimensional history of colonial and Revolutionary America made by Milton Bradley & Co. in the mid-nineteenth century. This engraved playing board was designed to teach naval tactics and terminology. Each player advances by the roll of a dice—but might be sent back to the beginning by landing on ill winds or a shipwreck. La Jeu de la Guerre. Ou tout ce qui observe dans les Marches et Campements des Armées. 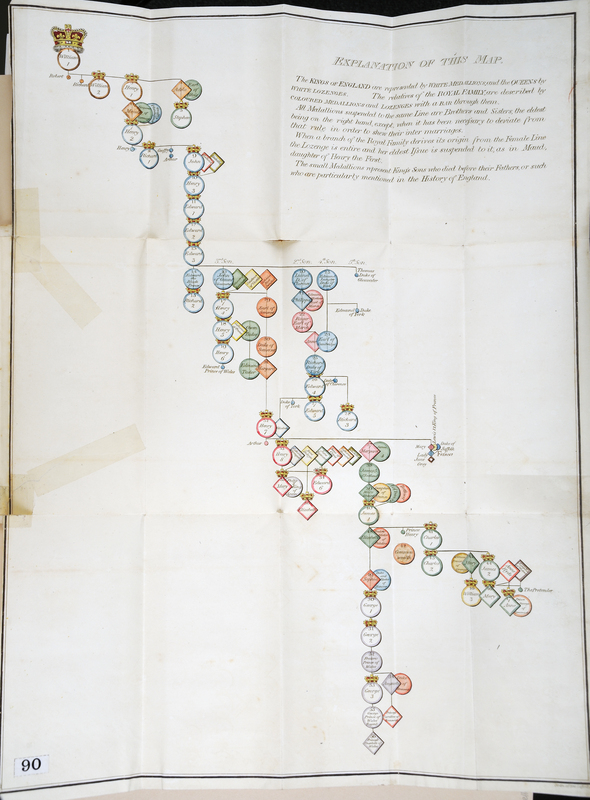 Dedicated to the duc de Berry and based on a seventeenth-century design, this “game of war” illustrates many aspects of army life. 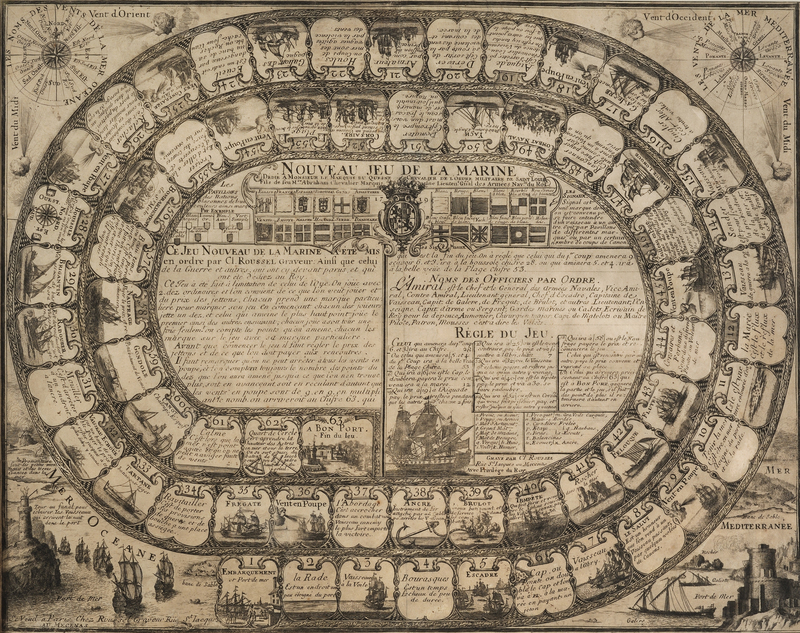 In this game, players progress through 157 circular medallions representing characters and events in English history from the reigns of William I through George III. The “War with America” is one of the last obstacles before the winner reaches the portrait of the king at the center of the board. Whist was a popular card game in eighteenth-century Britain and America. 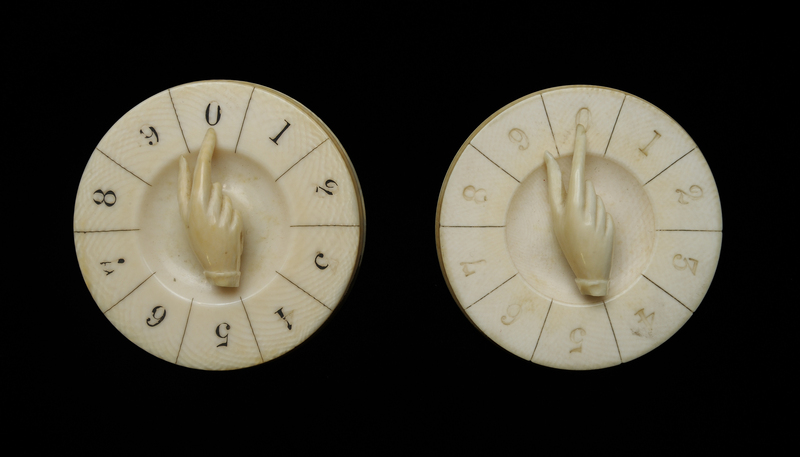 Players kept score using counters, which were made out of mother of pearl, ivory, metal or wood and could be richly decorated. In 1828 the marquis de Lafayette gave this pair of ivory whist counters to John Farley when he visited the Frenchman at his home, La Grange. Farley, a resident of Georgetown in the District of Columbia, had been introduced to Lafayette by Eleanor (Nelly) Parke Custis Lewis, George Washington’s adopted granddaughter. Milton Bradley & Co., Springfield, Mass. 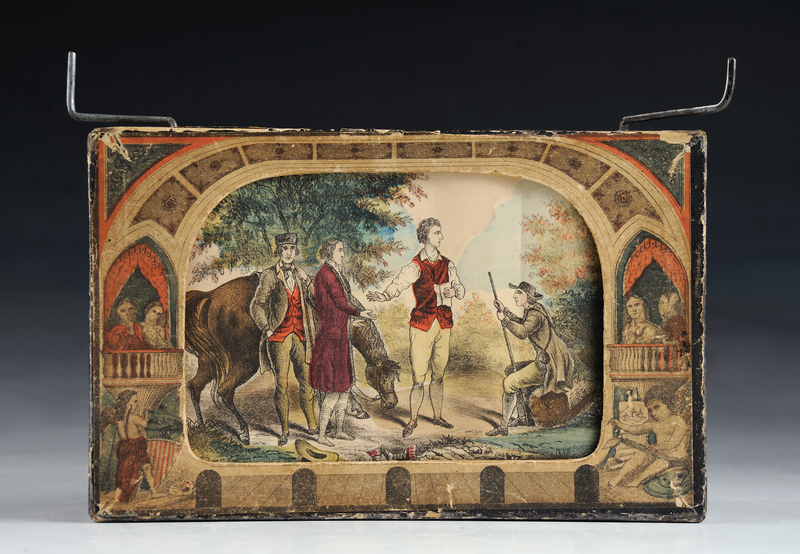 This toy consists of a scrolling set of twenty-four hand-colored lithographs set into a theatrical background. A child would present the images to their family as a show, using a script that accompanied the toy. Half of the scenes depict heroes and events of the Revolutionary War, reflecting what mid-nineteenth-century Americans celebrated from the nation’s founding. This scene depicts the capture of British major John André in September 1780. It was copied after Asher Brown Durand’s 1845 painting The Capture of Major André, which remains the best-known depiction of the event.